What’s the Best Way to Avoid Corrosion Under Insulation? As any facility manager, engineer, or construction person knows, corrosion under insulation (CUI) can be a huge problem if left untreated, and the results of leaving it to its own devices can be costly. What’s even more frustrating is that CUI is hard to identify and expensive to test for, since testing often involves removing the insulation system, which many facility managers are reluctant to do. So, with all of the problems corrosion under insulation can cause, is there a way to avoid it altogether? Unfortunately, there is no magic solution to stopping CUI. After all, the two basic ingredients that cause it are moisture and warmth. But by understanding the causes of CUI and using best practices to combat those causes, you can reduce the risks. Sometimes, the original design and specification of the mechanical insulation system is actually the beginning of CUI problems. When that is the case, it is most likely because the specifier used an existing specification without considering all the factors—including any new factors—that would affect system performance. Another potential cause is when the owner or contractor prioritizes reducing the upfront cost of the system over the performance, meaning that he long-term effects are often ignored. For example, if the main goal is to cut costs, a thinner insulation may be specified to save money, even if a thicker insulation would really be the most effective for the application in terms of energy savings. No single insulation thickness, material, or configuration will work for every project—that’s why it’s necessary for specifiers to take the time to select an insulation system that will offer the best performance over time. Failure to make an optimized decision results in big problems down the line, like corrosion under insulation. How? The system is at a greater risk of damage from things like exposure to weather and moisture, and deterioration from work access. This provides the perfect environment for CUI. The solution to this problem is obvious—don’t use mechanical insulation as a place to save money on a project. 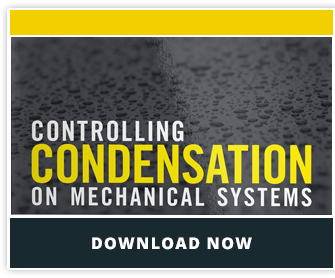 Unless the system is optimized for peak performance, major challenges will crop up down the line, resulting in a greater cost in repair and replacement of wither the insulation or the mechanical system itself. Insulation is often overlooked when it comes to facility maintenance. In order to catch CUI early, facility personnel should be trained to periodically inspect insulation systems and know how to identify early signs of failure that could be related to corrosion. Once a problem has been noticed, it should be repaired as quickly as possible to prevent any further damage. One important note: if pieces of the insulation were cut away in order to perform an inspection of the equipment, be sure that it is reinstalled and sealed correctly, or you could actually be making the problem worse. Another environmental factor that contributes to CUI is operating temperature. With temperatures above 300 degrees, most water evaporates before it has a chance to do any damage. But in other systems, moisture is much more dangerous and likely to cause corrosion, especially if the temperature is in the “sweet spot” of creating the perfect environment for CUI. Environmental elements that contribute to CUI are extremely difficult to control. While there’s no real way to combat environmental causes directly, focusing on proper design, specification and maintenance will help offset other factors.